When your K-8 school makes an investment in the Makers Empire 3D printing solution you will receive unparalleled support from Makers Empire and enjoy a world-class user experience. From day 1 we provide the information and support you need to successfully implement 3D technology into your school. Teachers can login with their email and the password that was sent to them via email. The Teachers’ Dashboard is where you will manage and view student’s designs. 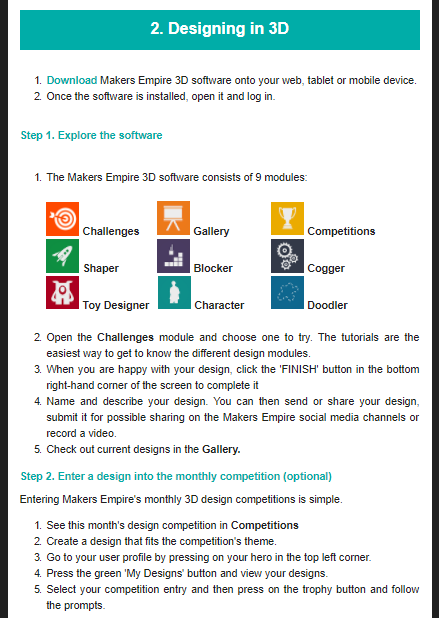 The next part of setting up is to download the Makers Empire 3D design app! Once you have downloaded the software you can explore the different design modules. Be sure to start with the challenges, which will help you learn how to use each module! 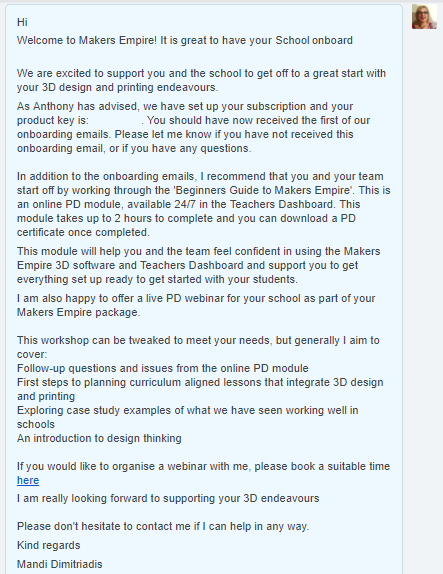 There is also a self-paced training for the Makers Empire 3D app found within the Teachers’ Dashboard for extra help. 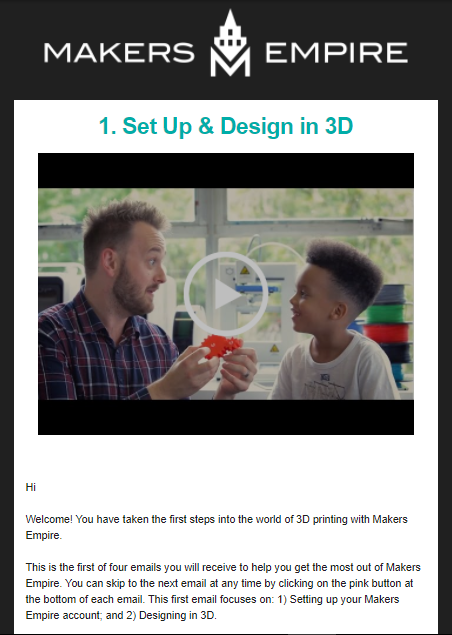 Second, the Makers Empire Learning team will send you a welcome emailThis email will connect you with our amazing professional learning team! They will liaise with you to setup a time for your professional development and are available to answer any questions you have along your 3D printing journey. 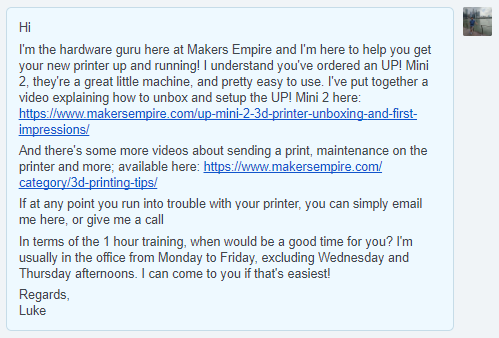 Third, an email from our 3D printer hardware expertsIf your school invested in a 3D printer, with air filtration system, from Makers Empire, our hardware expert support team will send you an email to connect so you can ask questions. We will also direct you to our array of 3D printing hardware videos with lots and lots of helpful information on set and use of your printer! 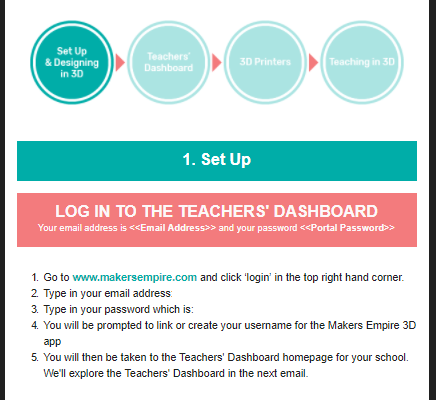 With Makers Empire, you will get all the information, tools, resources and support you need to integrate 3D printing into your school from day 1! Ideal for those who are short on time and those wanting to learn more about integrating 3D design and printing into the K-8 classroom. Ideal for those budget planning, those who want to learn if Makers Empire is a good fit and those who have lots of questions. Ideal for those ready to make a decision about Makers Empire's suitablity for their individual school. For district deals, please choose Book Demo.